Stars mourned the deaths of Keenan Santos and Reuben Fernandes, who were stabbed while trying to protect the women they were with, who had being eve-teased by drunks. Music director Vishal Dadlani even phoned the MLA, seeking justice. 'Call and express your outrage at Keenan and Reuben's murder. I'm dialling now! Just spoke with Mr. Ashok Jadhav, MLA of Keenan+Reuben's area, asking him to ensure that the guilty are punished! He was very supportive. Those saying that MLA Ashok Jadhav's supporting killers of Keenan+Reuben, call and tell him not to. That way, even if he wants to, he can't,' he tweeted. Director Punit Malhotra was shocked to hear the news. 'Just watching the news... Shocked to hear about the 2 youngsters, Keenan and Reuben. Need to stand up for justice for them!!! Heard one of the boy's father speak on tv. My heart goes out to him. Wish the culprits are severely punished!!!' he updated. Often called as the Rakhi Sawant of Pakistan, Veena Malik is all set to take over Rakhi's territory in India. The former Bigg Boss contestants with shake her booty in Tere Naal Love Ho Gaya. What do you think of Don 2's new poster? Priyanka Chopra might be busy cutting an album in Los Angeles but she is quite excited about her upcoming film Don 2, starring Shah Rukh Khan. The actress tweeted the latest poster of the film, and asked for feedback from her fans. And she got some from director Anurag Basu. 'SUPER DUPER LIKE!!!!!' he tweeted. What do you think of new Don 2 poster? Tell us! 'I'm going to start with an apology, I'm sorry for this negative message guys, its just that on days like today I cant stand the ignorance of some people. On my way to work this morning this guy really frustrated me. 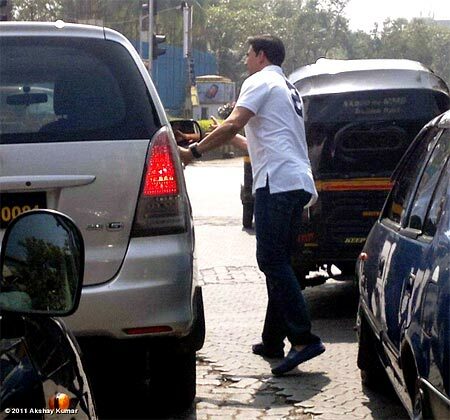 I had to get out of my car in the middle of Bombay traffic right by Mr Bachchan's house, & literally pick up off the road an empty packet of cigarettes that this man decided to carelessly throw out his window without a second thought. Not only do we have to put up with the fact he smokes but we also have to deal with the fact that he doesn't care a damn about his city or his motherland that God has so graciously provided for him. If we all treated the streets of India with as much love as we do our homes & temples, we would have 5 star ratings on cleaniness rather than being known as one of the dirtiest cities in the world,' Akshay tweeted with the picture (left).